Keno Statistic's Presentation on YouTube! * The 32bit version has been discontinued. 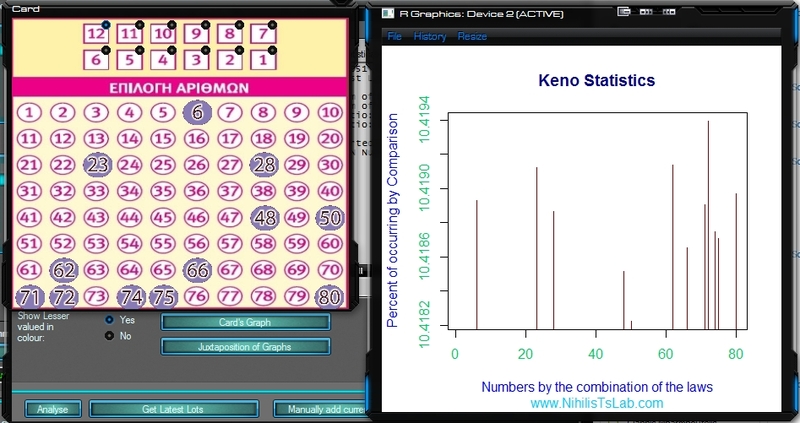 Keno Statistics is a programme whose sole purpose is the statistical analysis of Keno, and entertainment. Under no circumstances should it be confused as a means of gaining an unfair advantage. This is the main form; Everything on it has an explanation for what it does when you leave the cursor on it. 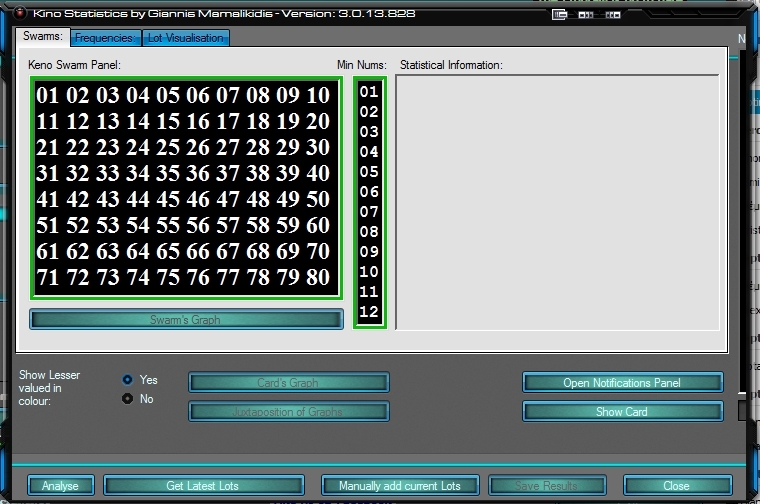 To analyse the lots and get the Numbers in an Order, push the button “Analysis”. To update the lots or to choose which lots should be loaded to the programme, push the button “Update Lots”. To transform Excel files (.xls or xlsx) into a programme readable format, push the button “Transform Files”. 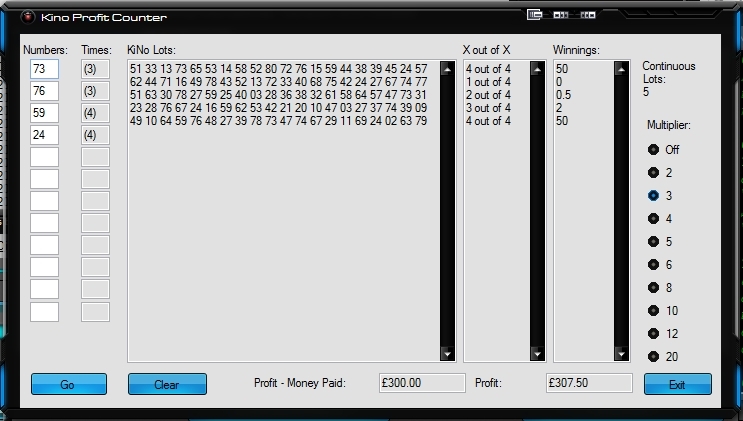 To find out how much money you’ve won or lost playing a number of lots, push the button “Profit Counter”. To calculate the initial probability of ‘k’ out of ‘n’ numbers to occur, push the button “Probability Calculator”. 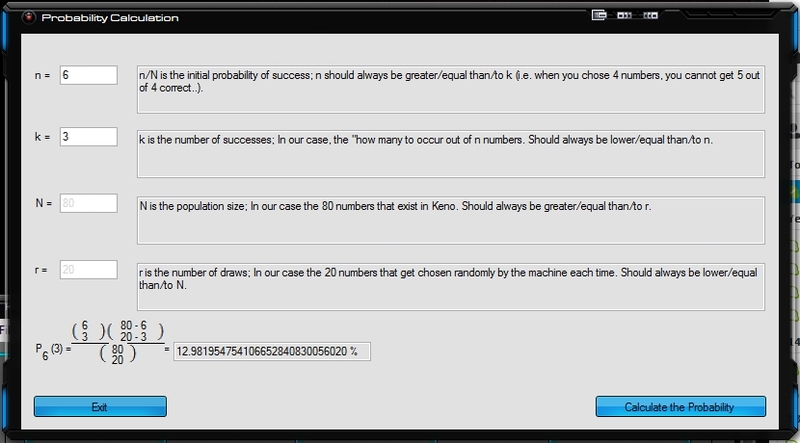 To read the underlying mathematics behind Keno, push the button “Mathematical Analysis of Keno”. The menu grants access to various other forms or commands like the programme’s settings, the Suggestion and Complaint form, the folders of the programme, quick access to the website, Registration of one’s Donation ID (if one has it), a repeat of the programme’s presentation, a repeat of the welcoming form, changelog and more. The command line can be used for numerous reasons. Amongst others, to automate some actions, to access various forms of the programme or as a scientific calculator as it support variables and functions and calculations with them and things like logarithms and trigonometric functions and other stuff. This is the Update Lots form. When we install Kino Statistics for the first time nothing will be shown on the “Downloaded Games” and “Backup Games”. We have to download the lots we need from “Online Games”. 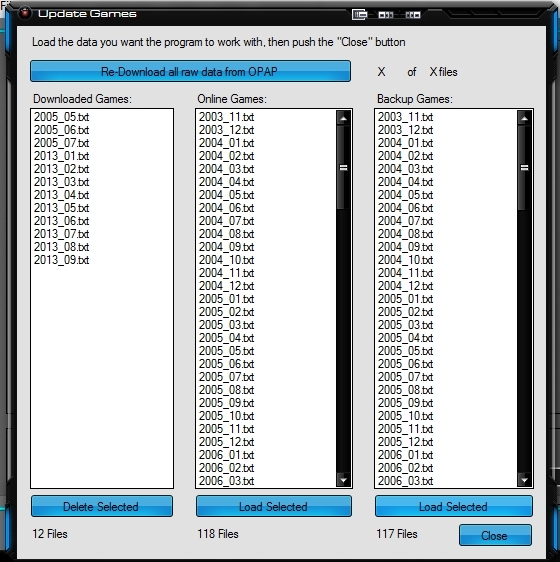 Selecting lots from “Downloaded Games” and pushing “Delete Selected” will remove the selected lots from the database, and so those lots will be disregarded by the analysis. Selecting lots from the “Online Games” and pushing “Load Selected” will download the selected lots from the Internet and the lots will be taken into account in the analysis process. Should we want to re-load that we’ve deleted before we select the lots from the “Backup Games” and then we push the “Load Selected” button and the lots will be taken into account in the analysis process along with any other lots on “Downloaded Games”. We always use the “Backup Games” to load any lot that is actually contained in there. Only if lots are missing from “Backup Games” are we to download it from the Online Games”. Caution: One can see here every lot until the last month’s one! For the lots of this month till now read below. The button “Re-Download all raw data from OPAP” downloads all the lots in an excel file from OPAP and then a time-consuming transformation must take place in order to transform all the files into readable-by-the-programme files. This is the Analysis Form which appears when we push the Main’s form “Analysis” button. By pushing the button “Open Notifications Panel” a panel appears where we can see all notifications that the programme has produced. However, even if we don’t push it, the panel will open by itself for some seconds when a new notification is fired. 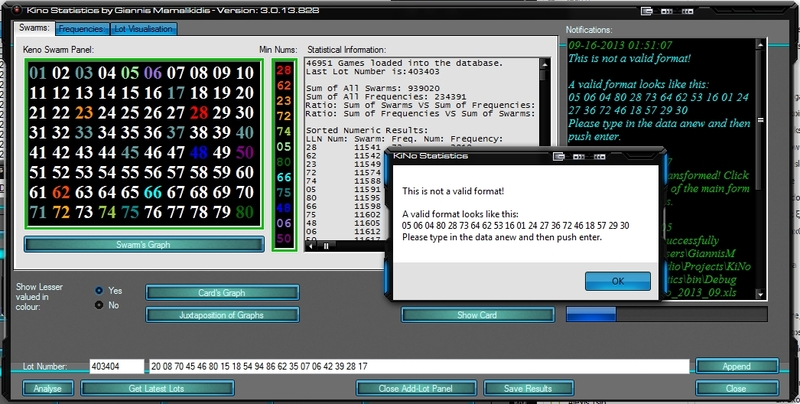 By pushing the button “Show Card” the Card Form appears where one can see the most probable numbers according to my own arbitrary mathematical formula that combines the probabilities given by all the laws and is thought to better approximate the true probability of each number. All the shortcuts that were on this form in previous versions (Ctr+U, Ctrl+S and so on) are still valid. This is the Analysis form, in which the “Get Latest Lots” button has been pushed so that the lots from the beginning of the month till the second we pushed the button are loaded. As soon as the button was pushed an automation took place, downloading this month’s file from the Database of OPAP and saving it on a default location on the hard drive; furthermore the file was automatically transformed and loaded into the programme’s database. Now it’s high time we pushed the “Analyse” button to acquire the most probable numbers. 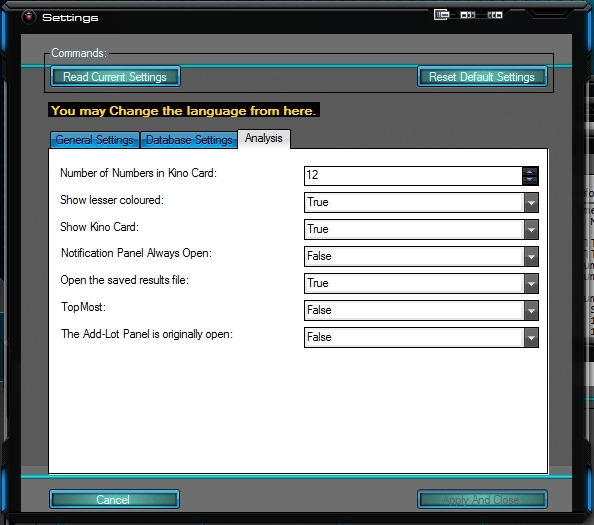 This is the Analysis form, in which the button “Analyse” has been pushed. We’re viewing the first tab (Swarms) and we can see the Number in Order according to times of occurrence. The numbers first 12 numbers are colour-coded after the colours of the rainbow, isolated on the “Min Nums”. So we see now that the number “28” is the first according to its occurrence rate, “62” is the 2nd in place, whilst “50” is the 12th number. On the “Show Lesser valued in colour” region if we push “no” then only the 12 most probable numbers will be shown in colour, and not the 20 first. On the “Statistical Information” region we see information that one can use to develop one’s own formulae and to extract any additional information one might need. 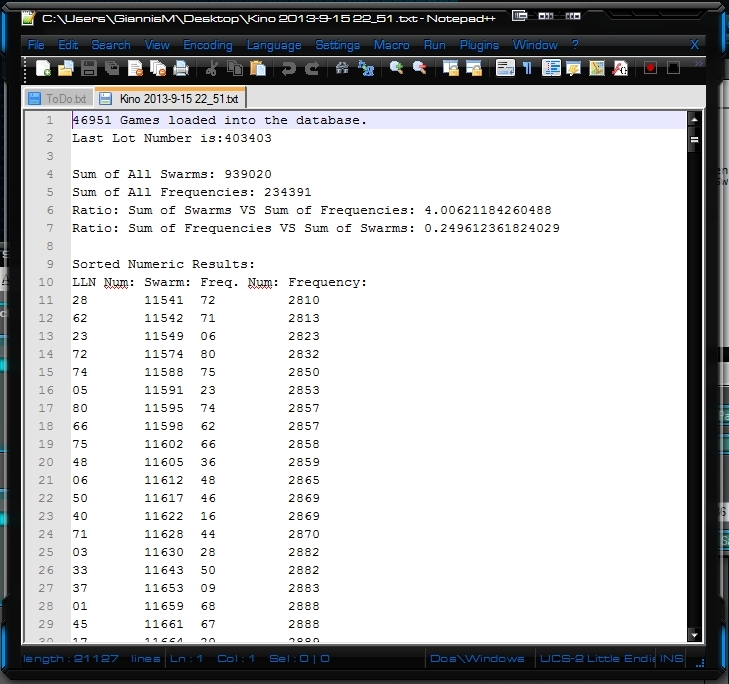 Pushing the “Swarm’s Graph” button bring the window on the left to the foreground, in which we can view how significant the variance between the first numbers in the order actually is. As we see on “Min Nums” the first numbers in the Order are: “28,62,23,72,74,05,80,66,75,48,06,50” and as the graph shows, the variance between the number “28” and “62” and “23” is negligible – however, we can see a deep plummet from the number “23” to the number “72”. So, some would say they’d chose the first 3 numbers only. This is the Graph’s use. 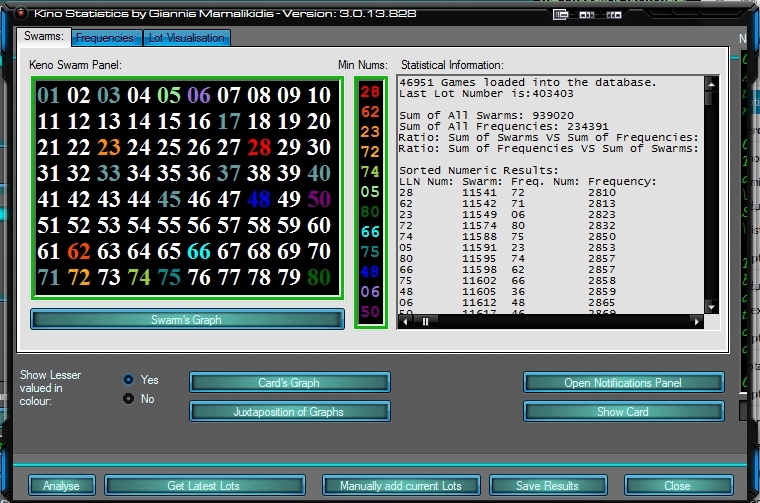 The Card form shows the First numbers in the Order according to both Sums of Occurrence and Frequencies. We choose one of the numbers on the top of the card depending on how many numbers we want to fill in. This way the card shows us the ‘k’ first numbers (where ‘k’ is the number of the numbers we chose and 0<k<13 in OPAP’s Keno). This is due to the fact that NOT all 12 illustrated numbers on the card are in the same place in the Order, and as such it would NOT be wise to choose ‘k’ numbers randomly from the ones illustrated. Instead we select the number of numbers we want to play on the top of the card and we see the ‘k’ first numbers in the Order. 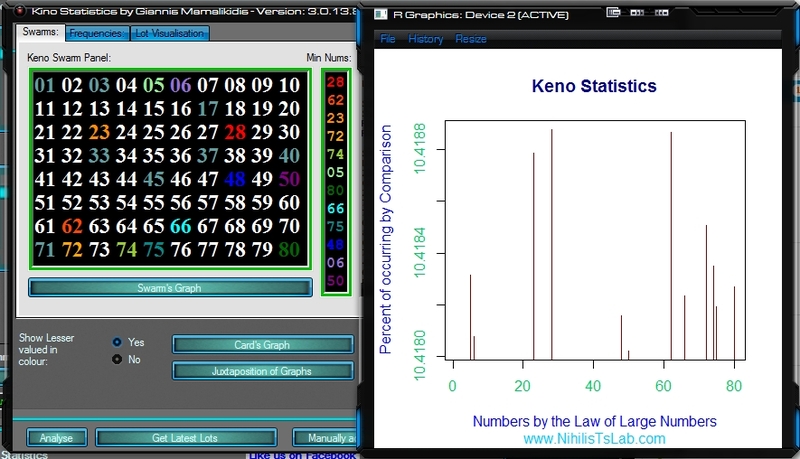 By pushing the “Card’s Graph” button the window/graph on the left is brought to the foreground and it shows the variance between the 12 First Numbers in Order given by the combination of the Order of Sums of Occurrence and Frequency rate. The way we collect information from this graph is the same with the previous graph. 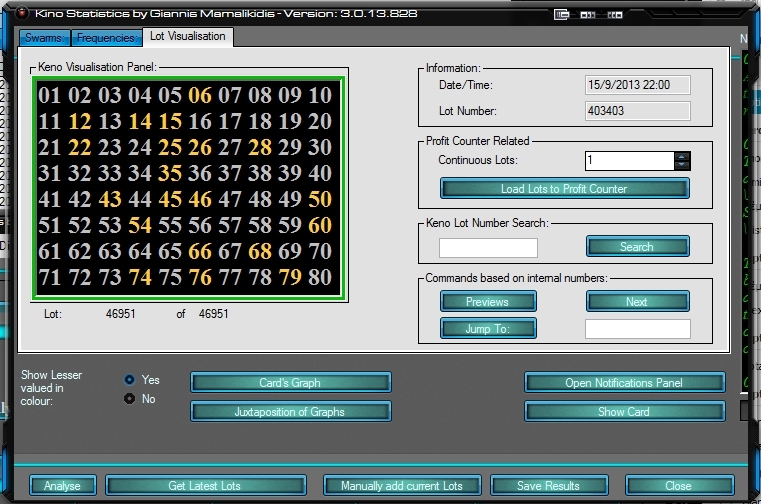 On the “Lot Visualisation” tab we can view the numbers of each lot as we would on a Keno Monitor; we can also search for a particular Lot Number. This is the programme’s Main form (the one that we see when we run the programme for the first time). We pushed the 2nd and 1st button before and we saw the respective forms. We will now push the fifth button (Probability Calculator). This is the form where one can calculate the initial probability (Hypergeometric Distribution) of any combination of numbers, e.g. 3 out of 4, or 10 out of 12, etc. For those who work with Hypergeometric Distributions in general, you can change the N,r so that any Hypergeometric Distribution calculation is rendered possible. This is the mathematical analysis of Keno. To build a programme is something; but shouldn’t the programmer have sufficient knowledge on the subject? 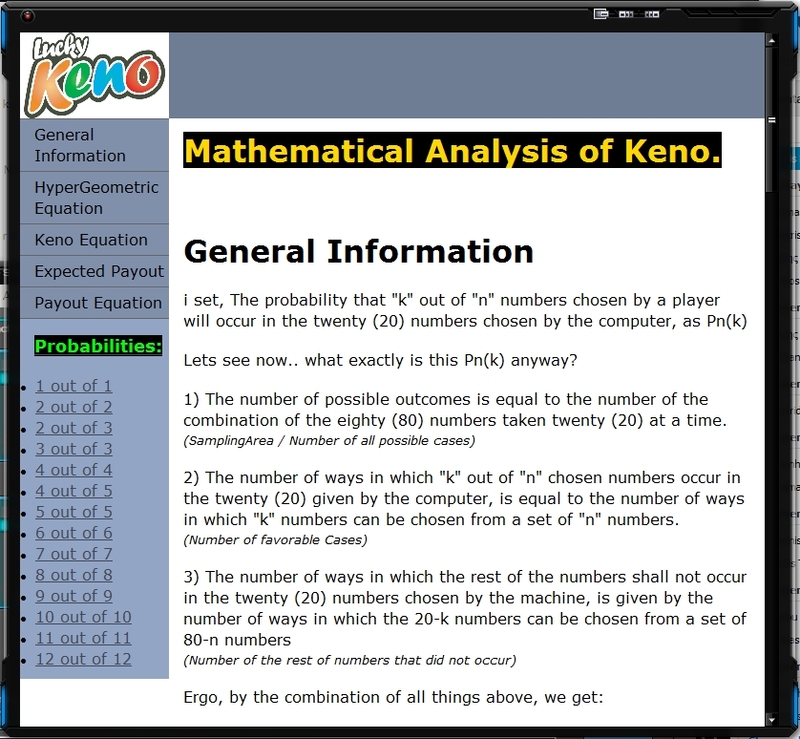 In this form anyone can read the mathematical analysis of Keno and acquire some useful information. It is written in such a way that it can be understood even by people with zero mathematical background. Having finished an analysis and chosen the third tab (Lot Visualisation) we can navigate on the Lots we’ve loaded on the programme. 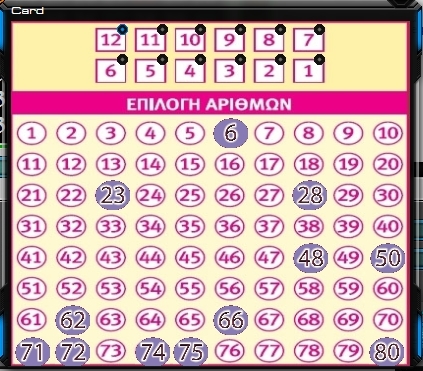 Should we want to find out how much money we won (or lost) having played certain numbers in 7 continuous lots, for example from Lot 403360 to 403364 then we merely have to navigate to Lot 403360, to choose the number “5” on the “Continuous Lots” field and to push the “Load Lots to Profit Counter” button and the form of the next picture will appear. 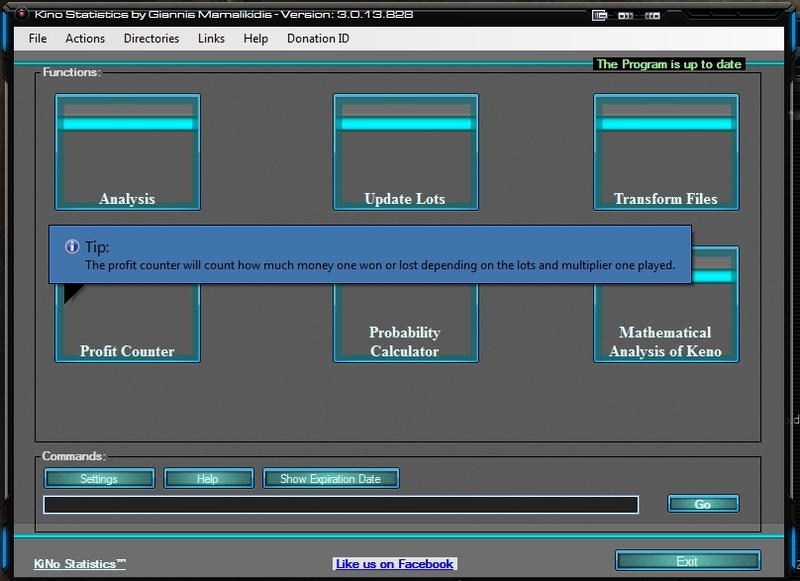 The Profit Counter calculates how much money you won (or lost) playing Keno. All you have to do is choose which Lots you’ve played, write the numbers you played under “Numbers”, select the “Multiplier” and push the “Go” button. By pushing the “Manually Add Lots” button the Analysis form will add this line atop the last buttons, where the user can append Lots manually. This is useful when you’re in a place where no Internet connection is available. 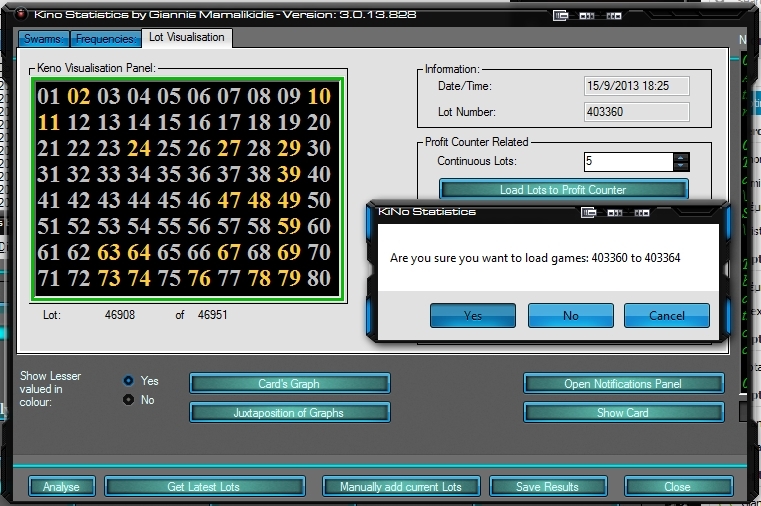 If we are for example on a Keno place, we can ask for a paper with the last 20 lots, and manually add as many lots as are missing to the database. If we type something incorrectly, then the programme understands is and won’t corrupt the database. By pushing the “Save Results” button on the Analysis form, all the statistical information in the “Statistical Information” region will be saved on desktop and we view then even better on a notepad of our choice. This programme bases the most probable numbers on those very extracted information so we can use these information to do anything else we want to. Inside Settings form lie all the settings a user might need in order to customise the programme to one’s needs. The settings are divided into three tabs (General Settings, Database Settings, Analysis). This form is accessible by various ways (such as typing “Settings()” on the programme’s command line, or pushing Ctrl+S, or via Main form’s Menu). Should you already have an account, fill in the left section, otherwise, create a new account.